Find other exciting news about Chrissy and her family here! April 24, 2010: At Talladega Super Speedway, Mike and Chrissy Wallace took the hight banks competing against each other in the Nationwide Series race. Chrissy brought home the car home in great shape! 2006: "The Queen City Princess"
Concord, NC (October 11, 2007) – Chrissy Wallace’s year has been nothing less than exciting. While most girls her age are stressing over English 101 and attending college football games on Saturdays, this 19-year old racing sensation is busy winning races and making a name for herself in auto racing. In 2007, Wallace recorded four Feature Division wins at Hickory Motor Speedway. She would then go on to record a third place finish in the point standings in Feature Division Bojangles’ Late Model Stocks and become the first female in history to become the track’s NASCAR Whelen All-American Series Rookie Of The Year. That, however, was not the first time she made history, as in June, while her Dad Mike Wallace was busy turning laps at Dover in the #7 GEICO Chevrolet in the NASCAR Busch Series, she would become the first ever female in the track’s 57-year history to record a Feature Division Late Model Stocks win. Now, as she starts to make solid progress on her way to becoming a NASCAR star she will start at the top, as she will be making an appearance on Friday, October 12th, at 2:00 PM (ET) with NASCAR President Mike Helton, Ned Jarrett and Brett Bodine at Books-A-Million at Concord Mills Mall in Concord, NC, to promote the book entitled, ‘NASCAR Family Album’. The book, written by Herb Branham and Buz McKim, focuses on the history of families within the sport of NASCAR. Wallace is both flattered and humbled by the opportunity to share the stage with three of NASCAR’s best and brightest. 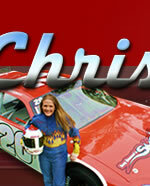 For more information about Chrissy Wallace, please visit: www.chrissywallaceracing.com.